VpCI-329 D is a ready-to-use vapor corrosion inhibiting oil-based rust preventive. VpCI-329 D provides excellent protection to metals in indoor and outdoor sheltered conditions. VpCI-329 D protects in two unique ways. First, oil-soluble corrosion inhibitors offer a tenacious film which clings to metal surfaces, providing excellent contact corrosion protection. In addition to this film barrier, VpCI-329 D releases vapor phase corrosion inhibitors into the air that attach electrochemically to the metal surface. 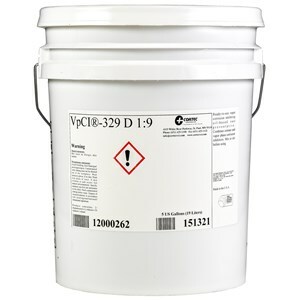 VpCI-329 D can be sprayed, dipped, rolled, or brushed onto metal surfaces. VpCI-329 D is great for protecting metal parts that require a light coat of oil for further processing and shipment; such as gears, spindles, coils, or any other metal part that uses oil for corrosion protection. Available in 5 gallon plastic pails (Cortec Product # 12000262) or 55 gallon metal drums (Cortec Product # 12000263). 5 gallon drum weighs 50 pounds and ships under our standard shipping rates. The 55 gallon drum must be shipped by truck. We will provide you with a freight quote before we ship the drum. VpCI-329 should be stored sealed. Agitate before each use. The shelf life of VpCI-329 D is 24 months in sealed containers.